"Drink up me hearties! Yo Ho!" "Captain's log, Stardate 43714.1. We have finally succeeded in eradicating the Phyrox plague on Cor Caroli Five, and will soon be preparing to leave orbit and proceed to our next mission. A rendezvous with the USS Hood to assist their terraforming efforts on Browder Four." Typical, you settle down to have a nice quiet evening of reading and brandy after saving an entire planet from a deadly plague when you get abducted by aliens and replaced with a singing doppelgänger. 'Allegiance' is a super cheap episode that finds Picard locked in a very vanilla cell with three complete strangers. Why are they there? No one knows. Who has abducted them? They don't know that either. The only thing they do know is that the beds are uncomfortable, room service never shows up, the food is atrocious, and there's no one around to help them score tickets for Hamilton. This place sure as hell will not be getting a favourable review on TripAdvisor from any of them. Four people locked in a room arguing with each other can make for great drama. Or even great comedy. This is neither. 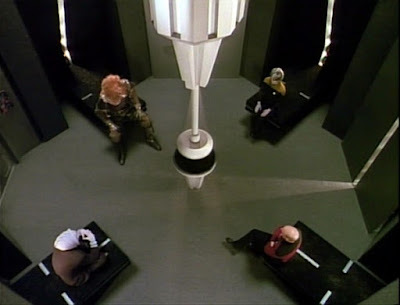 Whatever intrigue there was at the start of the episode quickly gives way to boredom as Picard and his fellow prisoners spend almost all their time arguing about how to open a door. The other prisoners are a dreary lot who are never given the opportunity to become anything more than the basic archetypes (warrior, coward) they initially appear to be. Honestly, if you are going to lock Patrick Stewart in a room with three strangers, at least try to make them interesting. Back on the Enterprise Picard's double is deliberately acting out of character. 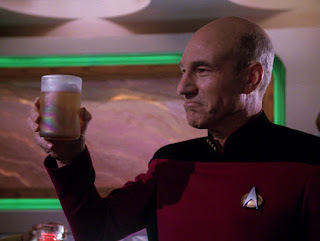 He's giving strange orders without explanation, visiting the crew during their weekly poker game, inviting Beverly for a romantic dinner for two, and, most shocking of all, buying everyone a round of drinks in Ten Forward and kick-starting some 24th century karaoke. This horrifies the senior staff more than his plan to fly the ship into a pulsar, potentially killing them all. All in all, 'Allegiance' is nothing more than a load of inoffensive filler that doesn't overstay its welcome. Everything is resolved rather easily once Picard exposes a cadet as one of the aliens, which he figures out halfway through the episode, and the aliens send everyone home with a not exactly sincere "Sorry about the whole abduction thing, no harm done, eh?". But Captain Jean-Luc Picard isn't one to let abduction, and poor room service, slide. He sticks the aliens in a force field for a bit and gives them one of his trademark stern tellings off, making sure they promise never to do it again. How he expects them to stick to that promise isn't made entirely clear. "Anyone got a deck of cards?" --The song that Faux-Picard sings is 'Heart of Oak', the official march of the British Royal Navy and several other Commonwealth navies. An odd choice for a Frenchman. --Patrick Stewart is clearly having fun as the doppelgänger Picard. Kove: "It's edible, but I wouldn't call it food." Picard: "In any event, we now know of your race and we know how to imprison you. Bear that in mind. Now, get off my ship!" Picard: "Then my doppelgänger caused no serious damage. The replica was convincing?" Riker: "Very convincing, but not perfect." Picard: "Not perfect in what way?" Riker: "Well sir, I find it hard to believe that you're that good a singer." Two out of four reviewers on TripAdvisor. A perfect review of a so-so episode, Mark. I particularly liked this: Honestly, if you are going to lock Patrick Stewart in a room with three strangers, at least try to make them interesting. Seriously! I think you're right that Stewart enjoyed the singing and romancing, though. He looked like he was having fun.